It started in London at a St. Paul’s Ash Wednesday Service. There was something sobering and meaningful about feeling the ashes smeared across my forehead. That was actually the first time I paid attention to the tangibles of the faith. After that I paid more attention to communion as well. The taste of wine and feel of bread. The cold pewter of the common cup against my lower lip. Faith often doesn’t feel real. We need something, even a small and symbolic something, to touch. 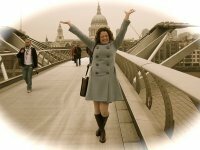 This is me, very happy, with St. Paul’s behind me. Another famous English church experience was responsible for my awakening to a love of liturgical worship. Evensong at Cambridge Cathedral was a profound moment of worship not based on warm feelings or sentimentality. It was my first real experience of a sacred moment that had very little to do with my personal feelings, and much more to do with the sights, sounds, and air in the space. But I need something I can touch. I can touch the earth. Evolution is the ape in the room when faith and nature meet for lunch. When we force the choice between literal 6-day Creationism and Neo-Darwinian materialism, we must either close our eyes or deny our souls. So many Christians opt to keep their eyes closed, or to fight data with dogma. We allowed the twentieth century to galvanize our faith into this cumbersome, rigid, behemoth must be authoritative on any matter, or it will shatter into a million pieces. So suddenly the Bible bears the burden of being a science text book. 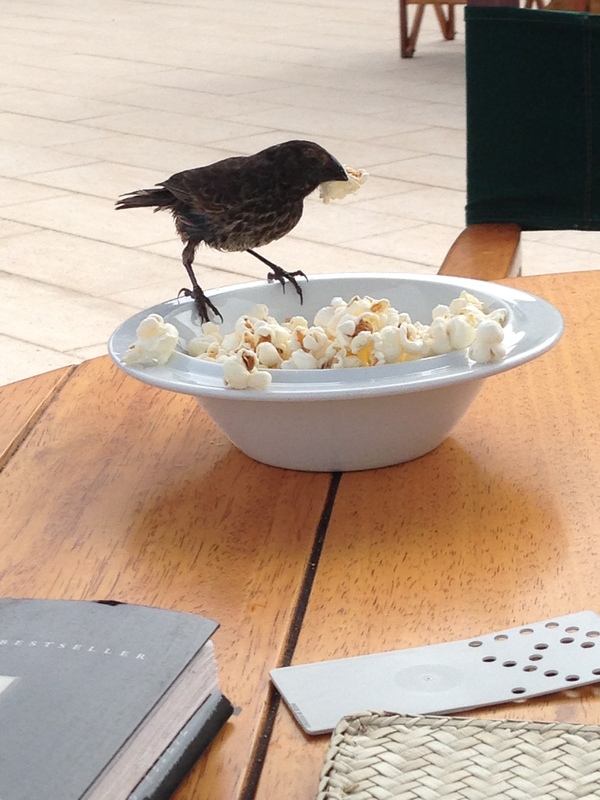 The finch shares my popcorn. Or we take the Don Draper (and now Peggy Olson) approach. “If you don’t like what’s being said, change the conversation.” We can’t make nature jive with the Bible, so we just turn our attention elsewhere. We make the earth a lesser thing. But I see things. I hear things. I feel things with my nerve endings, not just my emotions. I see things with my eyes, not just my reason. I want a faith that fearlessly affirms discovery and understanding of the things we can touch, as much as the things we cannot. So it was especially appropriate this year that I ended up in the Galápagos, “evolution’s workshop” for Easter…or Pasqua, as it became. I had ignored Lent this year, coincidentally. For the first time since my British awakening, I did not give anything up. I did not seek out Ash Wednesday or Maundy Thursday. My intangible emotions were in full revolt against all things sacred. Then, in a twist of divine brilliance, work sent me to the Puerto Ayora on Santa Cruz Island for the holiday. My hotel was down the street from the Darwin Research Station. Darwin’s finches shared my Easter lunch. And I was forced to answer the question: can I simultaneously believe in what is happening here and what happened 2,000 years ago? Here they are observing evolution in the beaks of finches. Can this possibly jive with a risen Jesus and a spiritual world? Watching the magnificent frigate bird with his red ballon gular sac, and the Galápagos Prickly Pear Cactus Tree with its uncanny structure, I considered the Easter story.Why was it so important that Jesus rose physically? Why not just send the Holy Spirit from the cross and skip straight to Pentacost? Because our physical selves matter. The physical world where we see flowers, hear birdsongs, and taste ceviche. Someone else understood that too. Jesus has not been as obliging with me as he was with Thomas. Instead he gave me Galápagos Easter. If every time I touch the earth I do not have to go to war in my soul, then I can live without touching Christ’s wounds. The moment I was set free to the natural world I can’t deny and the faith I cannot bear to lose, it was as though the earth burst forth in song. 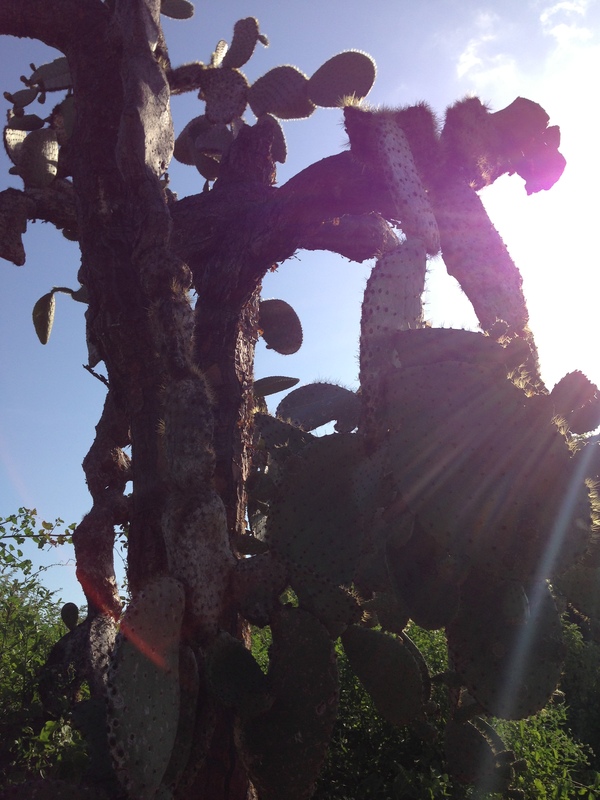 Sun glinting through the prickly pear tree looked like the Cambridge Cathedral. Leaves and dirt and water felt like the ashes on my forehead. I, for one, want a faith that goes to the Galápagos without fear of being dismantled. Rather than a porcelain mastodon that must stay safe and polished, I want a dynamic sapling that stretches and grows toward the light as it soaks up nourishment from the earth. I want to celebrate Easter and Earth Day – when we celebrate the things we can touch. Really enjoyed these reflections, Bekah. I’m a big fan of the things we can touch, see, smell, and taste, too. “For since the creation of the world God’s invisible qualities -His eternal power and devine nature – have been clearly seen, being understood from what has been made, so that men are without excuse.” Roman 1:20Need (NIV). Having studied the creation and the workings of the earth through the geologists perspective, I too as a Christian, have struggled with trying to integrate science with God. The important thing for me to realize, is that no matter how God created the earth, or how long it took, creation belongs to God, and he has revealed himself to us through it. Add we (set apart from the rest of creation, as we are created in his image) are to glorify God by apprectiating the wonder of the earth, and by being good stewards of the earth.